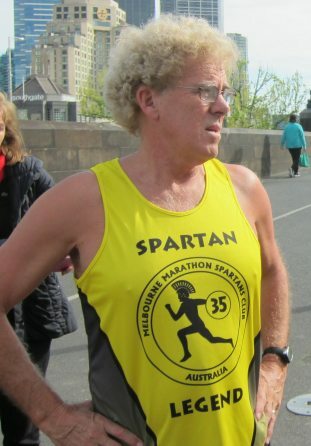 These photographs illustrate the official running singlets of Spartans. If you have some images that might be suitable please send them in!. Most of the 2012 photographs at the finish are provided courtesy of Nerida and Chris Muirden. 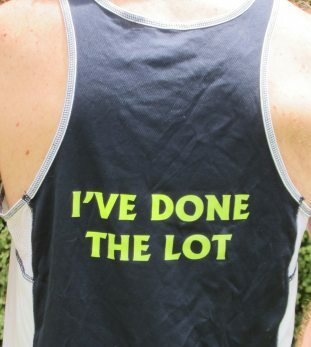 Not a Spartan singlet, these were issued to all finishers of the inaugural marathon. Here it is worn by Legend Nev Gardner. The autographs are optional extras. 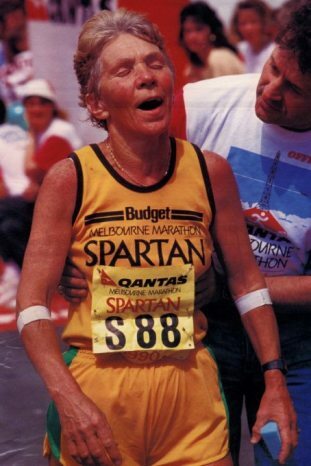 Shirley Young wearing the original Gold Spartan singlet issued in 1987. 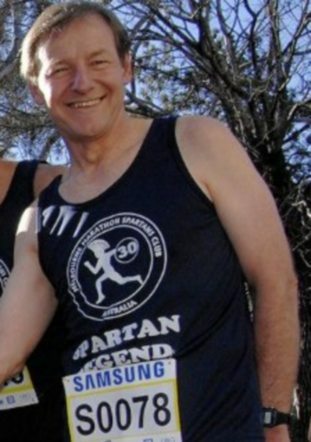 These singlets were provided by the race organisers, not the Spartans club. 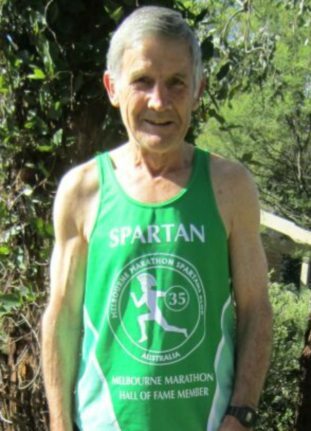 Paul De Stefanis wearing the green singlet awarded to all incoming Spartans. 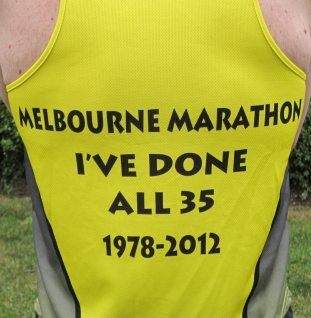 These are now provided by the Melbourne Marathon Spartans club. 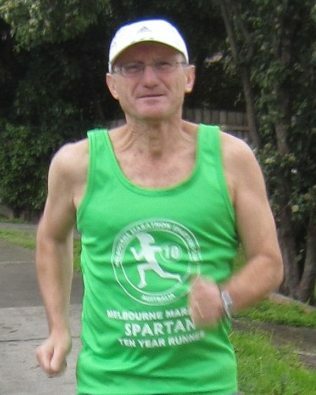 The 15 year singlet was not introduced for the 15th running of the Melbourne Marathon, but was made available some years later. Paul Kofman is shown at the finish of the 2012 marathon. 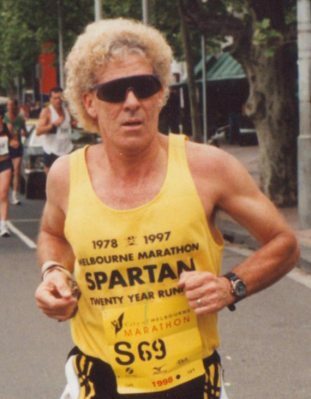 Peter Ryan during his 21st Melbourne Marathon in 1998. In keeping with the first Spartan singlet, this singlet is gold in colour. Spartans who hadn’t missed a race were referred to as “Gold Spartans”. 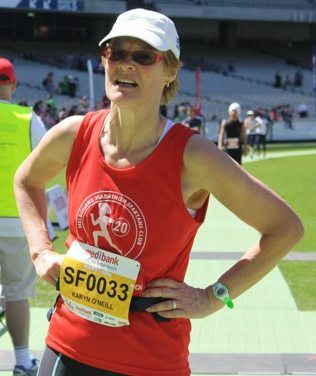 Karyn O’Neill after finishing the 2012 marathon wearing her 20 year singlet. The 20 year singlet was the first milestone singlet awarded to Spartans who were not “Gold” Spartans. 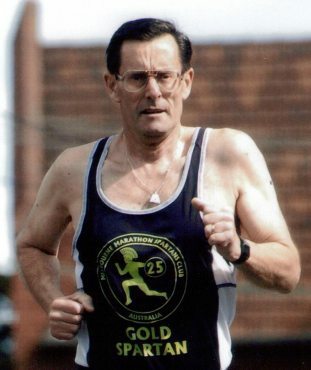 “Gold” Spartan John Dean on a training run after receiving his 25 Year Gold Spartan Singlet in 2005. The 25 year Legends singlet was the first to display a message on the back. 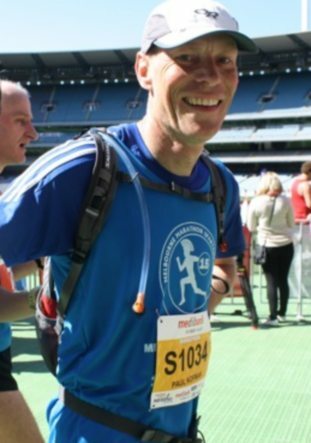 25 year Spartan Brian Walsh at the finish in 2012. 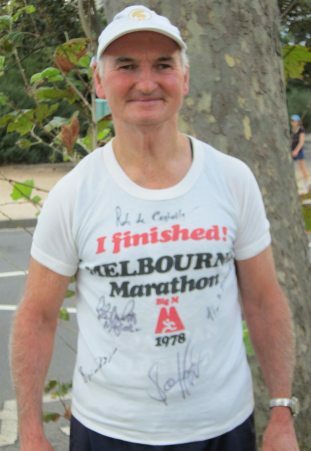 Legend Wayne Thompson at the start of the 30th Melbourne Marathon in 2007. The 30 year Legends singlet also displayed a message on the back. 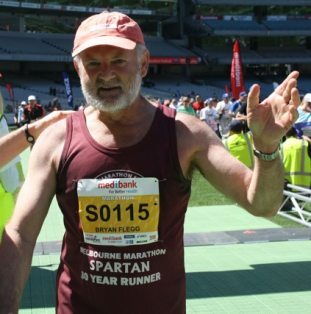 30 year Spartan Bryan Flegg at the 2012 finish. 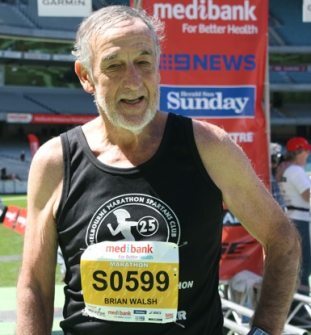 The 30 year singlet (see far left) was the first to use the term “Spartan Legend” to describe the 13 individuals who had completed every Melbourne Marathon. Legend Peter Ryan at the photo shoot for “The Wall”.. 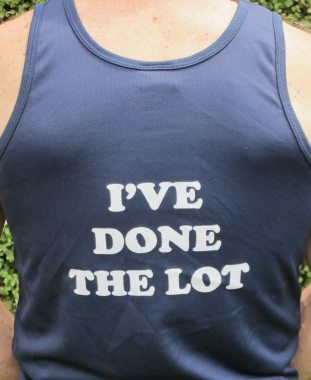 The 35 year Legends singlet displayed this wording on the back. Not everyone had understood what “The Lot” meant but this message is unambiguous. Ian Campbell wearing the “Hall of Fame” singlet introduced in 2013. This singlet will also be used as the 30 year singlet with the figure 30 in the circle. We hope that these singlets will make it easier to recognise these runners as Spartans when seen from a distance. 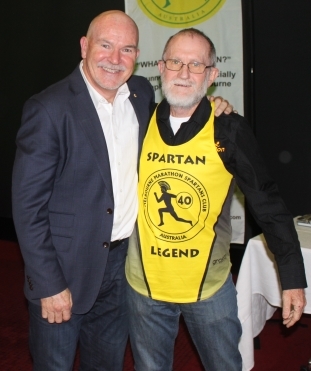 Bruce Hargreaves wearing the 40 year Legends singlet. He is pictured with Rob de Castella at the 2017 AGM. 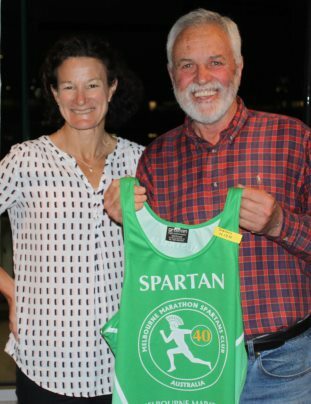 Dennis Nish being presented by Sonia O’Sullivan with his “Hall of Fame” 40th singlet at the 2018 AGM. 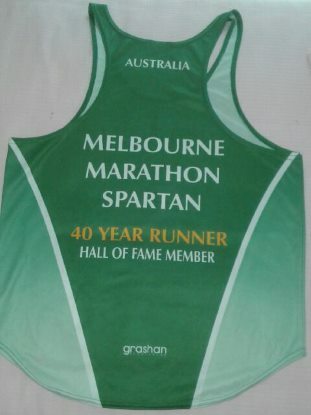 The gold lettering on the back of the 40 year Hall of Fame singlet distinguishes it further. Now that you’ve seen all the Spartan singlets, see the finisher medals from 1983 to today.